I love the Summertime but I also love the changing seasons. I think it's good to have a change and makes you appreciate what you have when you have it. I also love being able to dress for different weathers - I like the cosyness of coats and the carefree coolness of a summer dress and look forward to both at the end of the season before. The end of the Summer before Autumn (September - October time in the UK - interseason) can be all sorts of seasons, weather and temperature in one day. So when I shop around this time I look for versatile clothes that can be worn in all weathers, all year around. 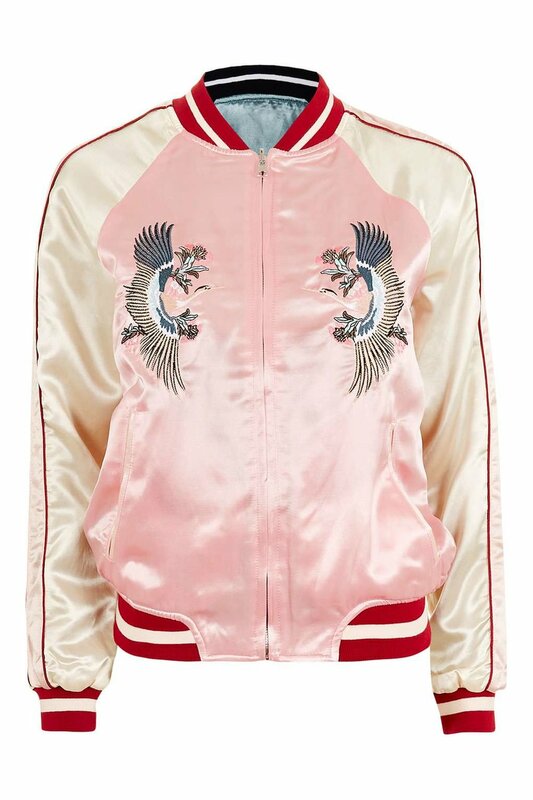 TOPSHOP have some great inter-season pieces in at the moment, I recently purchased an amazing reversible bomber jacket - it's like having 2 jackets in one and really does go with everything including your mood! I am also pretty excited about this black and white ruffle shirt, which I intend to wear with jeans and under dungarees, but would also wear it with a smart skirt or bright coloured trousers to meetings. We are also fast approaching boot season - I love a statement shoe and rarely play it safe when it comes to the colour of my footwear. If you have followed me for a while you'll know that I love a bright, leopard print or metallic (neutral) shoe and the same goes for boots. I am really looking forward to styling these red ones, but also have my eye on TOPSHOP's gold and pinks ones. A denim skirt is also a wise purchase for September, wear it now with bare legs, trainers or sandals then as the colder weather sets in with tights, boots or loafers. I also recently purchased this leopard print clutch. The good thing about a leopard print clutch is that it will go with everything and can be worn to anything. I got mine to go with a blue playsuit I recently wore to a wedding but have since worn it with so many different outfits and know I will for years to come. So if you are interseason shopping look out for versatile things that can be worn in all weathers, that can be dressed up and down and as always that make you happy! This post is kindly sponsored by TOPSHOP & Affiliate Window. All thoughts, clothes choices, ideas and purchases are my own!